Natural Picking Stone consists of a dozen of natural ingredients. It contains clay, seaweed, magnesium, grit, redstone, oyster shells, stomach grit, charcoal, etc. Natural Picking Stone offers an important supplement of natural minerals and oligo-elements. 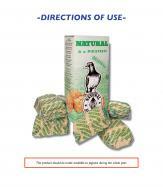 Natural Picking Stone does not contain any appetite stimulating substances and meets a natural habit of the pigeon. The pigeons will only pick on it when they really feel a need, e.g. during the breeding season, after a race or during the moulting season. In the course of the years Natural Picking Stone has turned into a the standard reference for the racing pigeon’s feed. It is sold in over 40 countries. Over a quarter of a million pigeon fanciers feed Natural Picking Stone to their pigeons. It is by far the most popular picking stone for racing pigeons in the world. Natural Picking Stones are freshly made every week and an essential element in the modern racing pigeon’s feed.